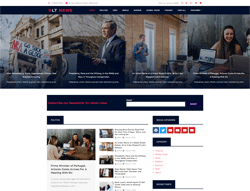 LT News is premium template tailored for magazine and news Joomla template websites. This template is the online version of newspaper and it is great for your new magazine or daily news update websites. LT News builds on powerful framework with 100% responsive layout (support for mobile devices) based on bootstrap, unlimited module position, strong shortcodes help you present content. Moreover, it comes with 4 color styles, has drag-drop tools and color settings helping to create wonderful websites with various layouts. News features are also supported by K2 extension, so you can use it to build news or magazine website.